Following the delay of the 4 Deserts Run attempt in 2014, Dave and his team of five will fly in 2 small planes across 8 of Australia’s 10 deserts and explore the Kimberleys. Follow Dave on Facebook and his blog as they live this adventure. Cross 8 major Australian deserts – Tanami, Great Sandy, Little Sandy, Gibson, Great Victoria, Strezlecki, Sturt Stoney and the Simpson Deserts. Complete unfinished business, by flying around the coast f the Kimberley, a section that was missed in the OWC Around Australia Flight in 2013. Have an adventure! – meet the locals and explore at stopover locations. Weather – is always a challenge with flying – August will be good North, but changeable down south. Remote areas – the flight will be through very remote areas. If issues arise – mechanical, sickness, injury – there would be no immediate help. Communication – flying in remote areas, it’s essential to be self-reliant. We need to ensure we have reliable communication equipment, in case of emergency. Accommodation – if delays are incurred, pre-booked accommodation could be lost. Ground transport – most vehicles are 4wd. These vehicles are always difficult with Dave’s access in & out, with only one carer to assist. Support Crew – 6 members including Dave’s wife Linda (to fly with Dave) & 2 friends and 2 carers. Support Plane – Piper Lance. Accommodation – pre-booked motels & cattle stations. Ground support – taxis from airport or transport provided by motels. It is important to have a team that will get along, be dependable and have a mixed skill set to overcome obstacles that may occur. This is critical as we will be in remote areas throughout the flight. In June, Dave and 4 friends will fly in 2 small planes across 4 major deserts and get the opportunity to explore Lake Eyre, Uluru and the Kimberleys. Follow Dave on Facebook and his blog as they live this adventure. Stay tuned! Cross 4 major Australian deserts – Tanami, Great Sandy, Gibson & Great Victoria Deserts. Dave to fly the Kimberley Coast solo. Weather – is always a challenge with flying – June will be good North, but not so good South. Support Crew – 4 members including Dave’s wife Linda (to fly with Dave) & three friends (includes carer). 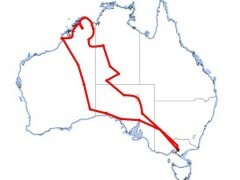 Many learnings from previous adventures, in particular the Around Australia Flight, have been applied to this adventure. The team is small, but the most important factor is that all members get along well with each other and each person can depend on the other. Insights will be detailed on completion of the flight. At times I loved it, hated it, and wondered what the hell I’m dong! This was the toughest challenge of physical and mental endurance for me and the team for 38 days. What an adventure! To become the 1st quadriplegic to fly solo around Australia. To open people’s minds to what someone with a disability can achieve and inspire all to follow their dreams. Weather – weather is the biggest risk for both delays and crashing. With limited local knowledge, changeable conditions and few landing sites the team could get into trouble. Reliability of modifications and aircraft – with extreme temperatures, long hours and flying in remote areas, if mechanical issues arise they may not be able to be fixed, or emergency landings this could end the flight. Fatigue and cold – would I be able to cope with such long days and extreme conditions? Challenges with my disability – pressure sores from sitting too long, overheating in the cockpit up north, hyperthermia in the south. Emergency landing on water or fire –unable to exit the aircraft myself, ditching over water or fire in the aircraft would mean death. Even managing to exit in the water, survival would not be possible. Delays – if significant delays occurred pre-booked accommodation and transport would be lost. Team harmony – would the members of the team get along for such a long period of time? Seven Support Crew – 4 pilots, 2 carers (half flight each), 1 project coordinator. Two Support Planes – Piper Lance & piper Archer (2 pilots in each). Base Support – Mum & Dad coordinating accommodation and ground transport from Melbourne. General Support – Media Manager and various people assisting around Australia. Accommodation – pre-booked & donated motels, people’s homes, from the communities, organisations around Australia. Ground transport – mainly donated transport around Australia and paid for some. Maintaining role clarity ensures a properly functioning team. People need to be involved for the right reasons. Their WHY needs to match the teams. Needed additional person to undertake filming as it is a very time consuming role. Myself and the team can do anything! With 4 months to go before the world first On a Wing & a Chair Around Australia Flight, the trial flight was critical to see how the team would work together and give Dave the opportunity to fly solo. The team ran into unexpected challenges. What will they face on the flight around Australia? Are they prepared enough? The team got a good reality check as to what the challenges are going to be for Dave as well as for them. Adventure blog. To refine roles for each team member and develop relationships. To develop/refine systems and processes for the team functions. To test each team members skills and see how they work together as a team. To identify additional issues, risk or challenges that had not been considered. Weather – January usually has reasonable weather, but it can be very hot and windy. Heat – the weather forecast was HOT, high 30’s! This is a big risk as Dave can’t control his body temperature. Dave could overheat easily, risking death. Water crossing – the team would experience their first water crossing for all members. Overcoming the fear is the challenge. Team unity – would the team members work together and develop good relationships. Five Support Crew – 4 pilots, 1 carer. Two Support Planes – Cessna 172 & Piper Archer (2 pilots in each). Ground transport – taxis from airport. Fear – The team achieved their first water crossing. Overcoming the fear was easier than expected. Team members – Two team members could not attend the flight. This made it difficult to develop the necessary processes but more importantly, giving all an understanding of how the team will function and what each person’s role is. Team roles – Identified the need to change Linda’s role as a carer to Project Coordinator, where she is better suited and more effective. An additional carer was now required. Heat – I overheated in the aircraft at Goolwa SA, due to the excessive heat (48 deg C) coming close to a more serious issue. Need to develop an effective spray system in his aircraft to cool down. Delays – Need to allow for additional delays such as ground transport. Systems – I realised I needed to develop a better organisational system in the cockpit with maps, equipment, pre-program radio frequencies etc to function efficiently. Media & Social media – dealing with the media, completing a blog and updating Facebook each day requires far more time than estimated. More time needs to be planned. Smaller improvements – Identified many smaller improvements in systems/processes, mechanical issues, equipment and provided good insight into the level of preparedness required to manage unforeseen issues. One plane, one quadriplegic, one carer. No support. This was going to be a very tough adventure! The flight challenged my skills, planning, mental and physical endurance. An adventure through some of the most remote areas of Australia, deserts, Lake Eyre, Uluru and beyond with engine trouble plaguing the flight. Definition of stress: having an aircraft engine running very rough over tiger country with nowhere to land, hundreds of miles from help. Have an adventure! Fulfil a dream of flying over Lake Eyre and Uluru. Test my endurance for long distance flying and repetition. Get insight into the challenges or issues I would face with the Around Australia Flight. Weather – is always a challenge with flying. However April is usually more stable for flying south and central Australia. Remote areas – the flight was through very remote areas. If issues arose, mechanical, sickness, injury there would be no immediate help. Communication – flying a solo aircraft there is no back-up. Ensuring reliable communications in case of emergency. Accommodation – if delays were incurred pre-booked accommodation could be lost. Ground transport – most vehicles are 4wd. It will be difficult getting access with one carer to assist. One Support Crew – 1 carer to do everything, help me personally, refuel and maintain the aircraft. Ground transport – taxi’s from airport or transport provided by motels. Resilience – getting through the difficult challenges such as the mental stress from the constant engine issues over remote areas, the long and exhausting days gave me confidence in my endurance levels and capability. Blog & Media – an efficient process for uploading photos and blogging each day was needed. It took most of his nights to complete them. The few media commitments were a lot more demanding with the flying than I had anticipated. Team – it is imperative to have sufficient support for the Around Australia Flight. Two carers will be needed, a person to coordinate accommodation etc, do social media & photography and preferably two support aircraft. Flexibility –need to reassess and adjust as unexpected issues and circumstances change. Walk away or delay if the risk is too great. Aircraft – The engine on the Jabiru played up for over half the flight with periodic vibrations increasing over time. The cause of the issue was overheating and valves being cooked. Significant changes were required to provide reliability. With the planning of the On a Wing & a Chair flight going on in the background, myself and a couple of die hard pilots took the opportunity to fly to some of the most remote areas of Australia, Cameron’s Corner, The Dig Tree and the famous Birdsville Pub. An adventure I had wanted to experience since I was 17. Four planes left, three came home! Test the performance of my Jabiru aircraft following modifications to the engine in preparedness for the around Australia flight. Land at Cameron’s corner, the Burke & Wills Dig Tree and Birdsville Pub for a beer. Determine a team members suitability for long distance flying. Develop an efficient process for blogging and uploading photo’s each day. Weather – spring is usually very unsettled, the weather was changeable and very windy. Airfields – the airstrips are very remote, soft & sandy with changeable conditions making landings and take-offs challenging. Heat –as I cannot regulate my body temperature, I need to be careful not to overheat in the aircraft. I was equipped with his spray bottle for cooling. Team unity – would the team members get along? Support Crew – 1 carer to assist me, 1 coordinator, 3 pilots and 2 passengers came along for the trip. Three Support Planes – 2 Jabiru J230’s & Jabiru 160. Ground transport – taxis from airport or transport provided by motels. Blog – an efficient process for uploading photo’s and blogging each day was achieved, however the process needed to be refined further to reduce time. Team members – it is imperative that the people selected on the team can handle the challenges of flying and conditions, have the right temperament and professional outlook. Risks – one aircraft crashed on take-off at Cameron’s Corner after helping another aircraft. Myself and another aircraft aborted landing due to gusty cross winds. Consider whether a stranded aircraft should be left and the functioning aircraft continue to a safer landing site, then source appropriate help. What can go wrong, usually will go wrong! Supplies/equipment – most of the lunch supplies were in the downed aircraft, therefore the aircraft that flew on had limited supplies. All aircraft need to be self-sufficient. They require daily lunches, necessary supplies or equipment in case of separation. As my first cross-country flight, I flew as part of the Navex flying group on a 5-day trip around country NSW and VIC. I pushed my own limits and the limits of my trike and was left feeling like a failure. To achieve my first cross country solo flight. To determine the limitations of my trike modifications. To test my own limitations for flying long distances. Weather – I had not flown in any adverse weather conditions, only in light winds and optimal flying conditions. Distance – this would be a challenge due to the low air speed of the aircraft especially with head winds. Reliability of modifications – would my modifications be up to the challenge of a long flight? Fatigue and cold – would I be able to cope with extreme conditions? One carer – to help me with everything. Other pilots – could provide assistance for aircraft related assistance at times as other pilots were part of the flight. Ground transport – a 20-seater bus to provide ground support carrying gear, fuel and transport from airfield to accommodation. Accommodation – pre-booked motels on route. Weather conditions were poor with wind, rain and generally rough conditions, I was able to pilot the aircraft effectively once in the air. Ground steering the aircraft with the hand lever was impossible in even light /moderate wind. Need to redesign the ground steering to allow both hands holding the wing and steer the aircraft on the ground by sucking and blowing on a tube. The Microlight trike – Edge X 582 is not suitable for cross country flying. Too slow with even a light head wind. Upgrade to faster aircraft with more stable wing – XT 912 with Cruze wing.